American DJ Dotz Panel 2.4 DJParts - All Variety of Parts that DJ Needs. ADJ’s Dotz PANEL 2.4 is the perfect size Wash/Blinder fixture for DJ,BAND small stage with advanced COB LED technology allowing for a powerful LED engine to be placed in a small amount of space. Includes Barn doors. These COB fixtures create a great Visual effect for Patrons without the use of FOG. The result is a high output, smooth color mixing fixture powered by 8 x TRI COB LEDs. Suitable for staging and nightclub lighting because it produces wide covers at a short distance and has no RGB color shadows. 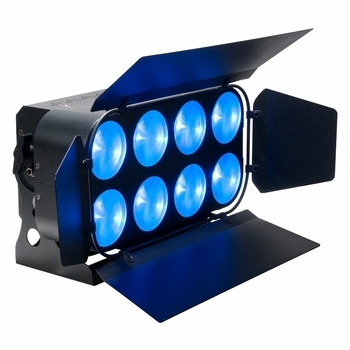 The fixture has many pro features such as: 0-100% electronic dimming, strobe/pulse effect, built-in shows and colors macros, and a 4-button LCD DMX display. Dotz Panel 2.4 may run in its stand-alone mode from built-in programs, sound actively, or from a DMX Controller.